The prologue describes a killer freshly arrived on the streets of London, finding a victim almost straight away. Meanwhile Joel reluctantly agrees to help Kara Geenan find her lost brother who she insists is in trouble despite having only been missing for a day. Hitting the trail, It's not long before Joe starts finding bodies and things start to go a bit pear-shaped. Dust and Desire doesn't provide much of an introduction, instead focusing on the plot from the start. It's also quite a dark start, the author providing a provocative and tense opening chapter. I loved the style that the author uses, it's less procedural and more like a thriller with elements that border on the horrific. It's an effective combination and works well here. As you might expect Joel Sorrell is the imperfect hero, struggling to deal with things in his personal life to the point that it affects his work, often finding solice at the bottom of a bottle. He also has an attitude to match, a dry sarcastic wit and realistic, perhaps fatalistic view of the world. The book switches between Joel trying to find this murderer and providing some background to the individual in question. While this approach does of course mean that it isn't in any way a "who-dunnit", the real mystery is who pulls the strings. That mystery remains all the way to the tense and dramatic conclusion. The story is clever and the style down-to-earth, it shows the rougher side of the country and also of peoples natures. 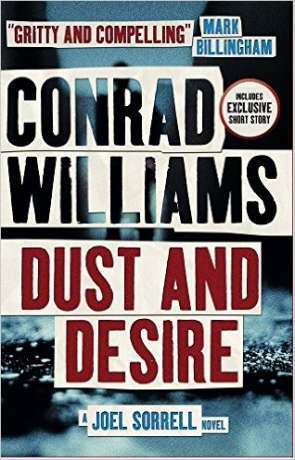 Dust and Desire is a clever mix of elements that all meet in a dark, grungy crime story - it's fast and entertaining and doesn't let you go right until the end. A promising start to the series. Written on 28th November 2016 by Ant.